Starting a blog can change your life. If you’re looking for a career with flexible hours (perhaps so you can stay home and look after kids – I’m typing this with a baby sitting on my lap), unlimited earning potential (for real – more about that in my next post; it’s a doozy!) and the freedom to build a career around doing what you love – whatever your passion – there is absolutely no better job on the planet. A lot of people think or dream about starting a blog but never get around to it. It seems like the setting-up part would be too hard or technical or scary, right? I’m about the most non-techy person on the planet, so believe me, I get it. 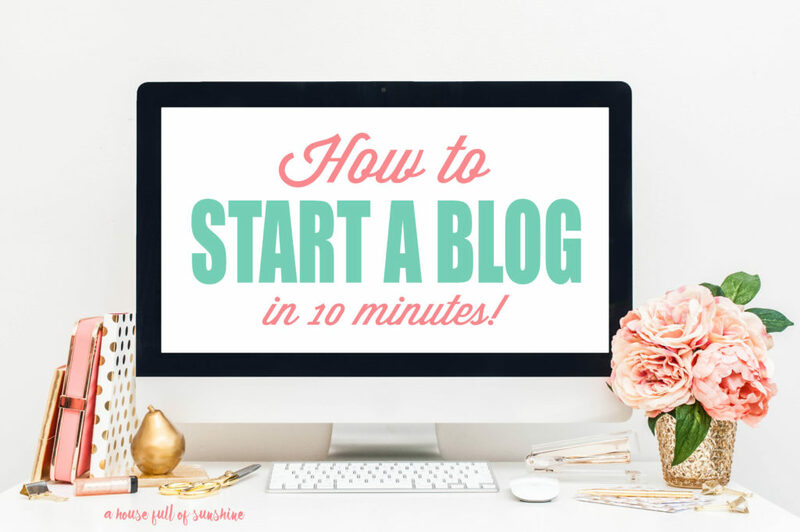 But the truth is, you can set up your blog in about 10 minutes flat – and I’m going to show you exactly how. It’s honestly so simple. In 10 minutes time, you could either still be making excuses, or you could have your own blog already up and running. It’s that easy. So girl, if you’ve been putting it off, it’s time to take the plunge. I’m here to hold your hand and walk you through it step by step. Take 2 minutes and jot down a list of ideas for the name of your blog. This is the fun part! Try to think of a name that’s simple and memorable. We’re going to use this to set up your domain name – that’s your address on the web, starting with “www” and ending with “.com.” It’s usually just the name of your blog without all the spaces. So, my blog name is A house full of sunshine, and my domain name is www.ahousefullofsunshine.com. Dot com addresses are much easier to remember than alternatives like .net or .org. For this reason, I wouldn’t recommend using anything other than a dot com. But there’s so many websites and blogs out there already, that you’ll find a lot of names are already taken. So don’t spend ages agonising over the perfect name only to discover you can’t use it anyway. 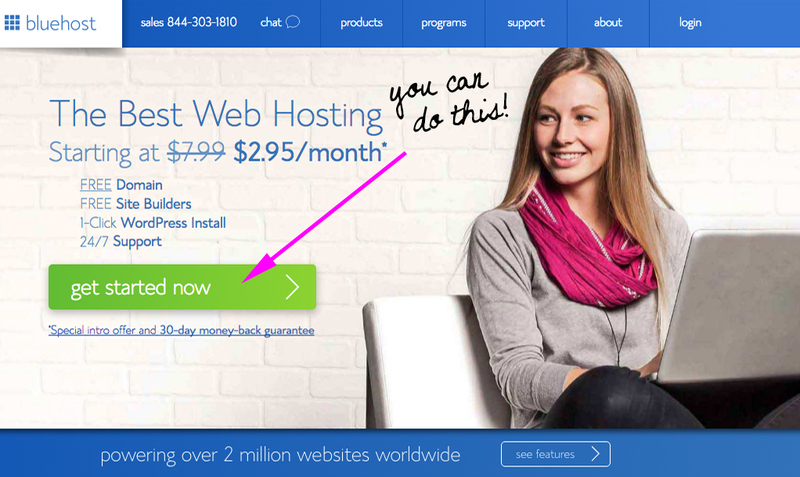 Let’s head on over to Bluehost to see if your domain name is available. Bluehost is a hosting service. They’re like your landlord – you rent virtual space from them so your blog has a home on the web. Their prices are super competitive – it costs less than a cup of coffee a month, and they throw in your domain name for free. Next, select your package. The basic package is all you need to get started with. Now it’s time to plug in the name you thought of earlier. It may take quite a few tries to find one that’s available, so don’t be discouraged – you may need to get creative! Next you’ll see a bit more information about your package. 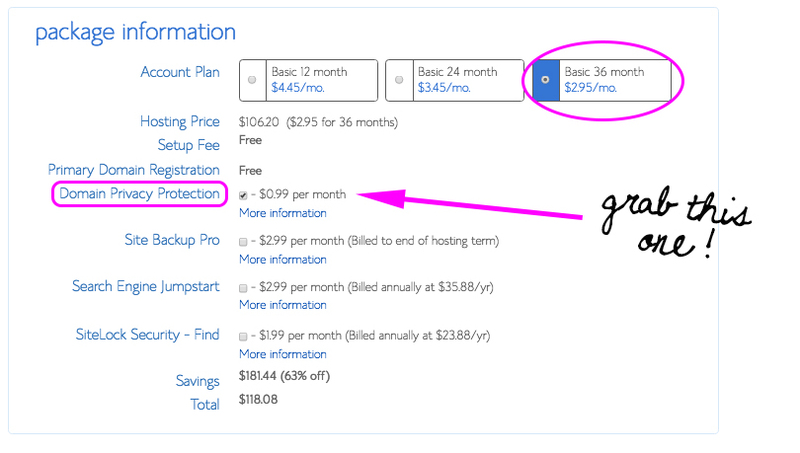 The cheapest option is the 3-year plan, so I’d suggest choosing that one. 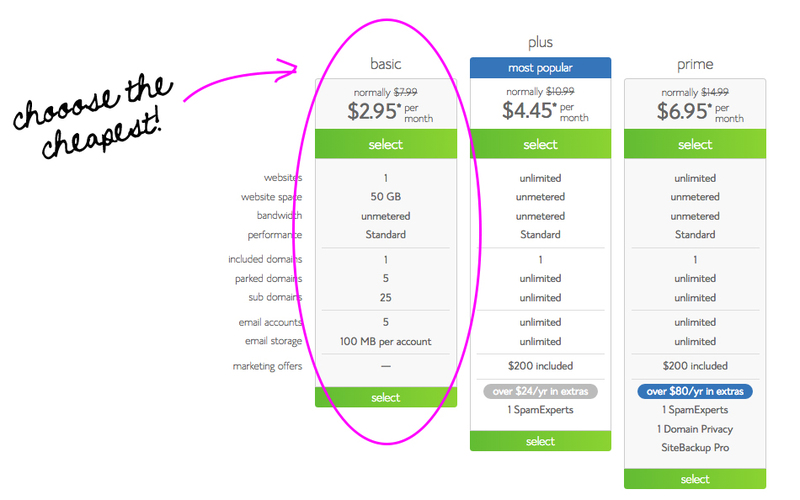 In order to keep their monthly price this low, they do require you to pay for the whole plan up front. But there’s no lock-in contract, so if you stop blogging before then, you can just cancel your account and get a refund. Now that you have your piece of virtual real estate, you need someone to build your house (or in this case, blog). 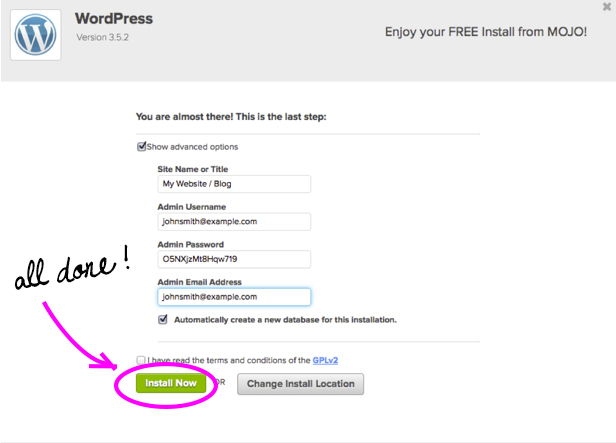 WordPress is what you use to do that, so the next step is to get it installed. Lastly, you need to set up a username and password for your blog. Click “Show advanced options.” I recommend using your email address as your username, and choosing a strong password. Make sure you write it down! That’s it! See… I told you it was easy! Of course, there won’t be any content there yet. To access the behind-the-scenes admin part of WordPress where you actually write new posts, type in your web address and add /wp-admin at the end. (eg www.myblog.com/wp-admin). Then log in with the username and password you just picked. I’m proud of you! You’re already streets ahead of everyone else who dreams about doing this very thing and never makes it happen. If you take the plunge, make sure you let me know so I can check out your brand new blog! And feel free to ask if you have any questions or get stuck with anything. This post contains affiliate links. You can see my disclosure policy here. Does WordPress work to build a basic business website NOT a blog? I’m looking for something simple for an online presence. Yes, you could use it to build a website. It’s a very flexible platform. Essentially what you’d be doing is creating static pages that you can navigate between, instead of posts that you update. 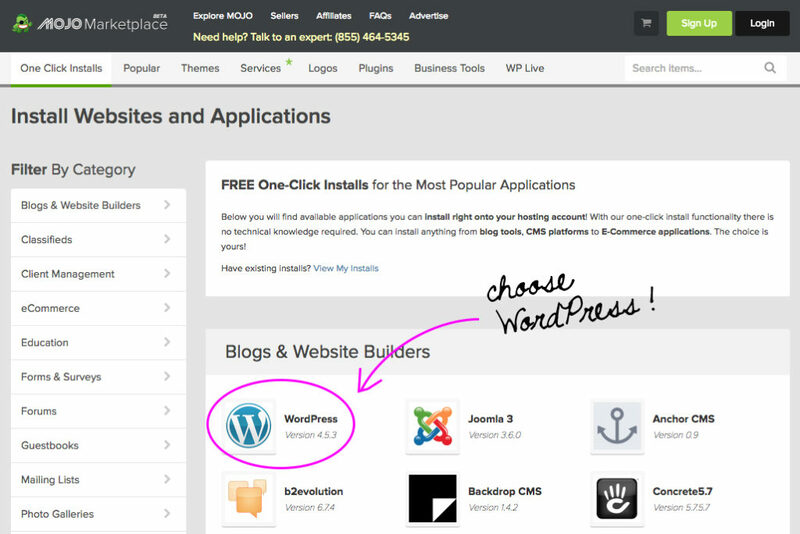 WordPress also had plugins for just about everything, meaning if you want to set up an online store on your website, for instance, you just install a commerce plugin instead of having to code it in yourself. It’s extremely user friendly. Lots of website designers build their sites on WordPress for that reason. Karen – for some very lovely reason your posts always seem to come along just at the time I need to read them – a big thank you for the inspiration. Yesterday evening I took the plunge – thanks for helping me turn a wish into a blog! I still need to get my blog looking a bit nicer and convert the content in my head into content on my blog – but will let you know when my brand new blog (The Paperback House – because our house is full of books) is ready to check out.